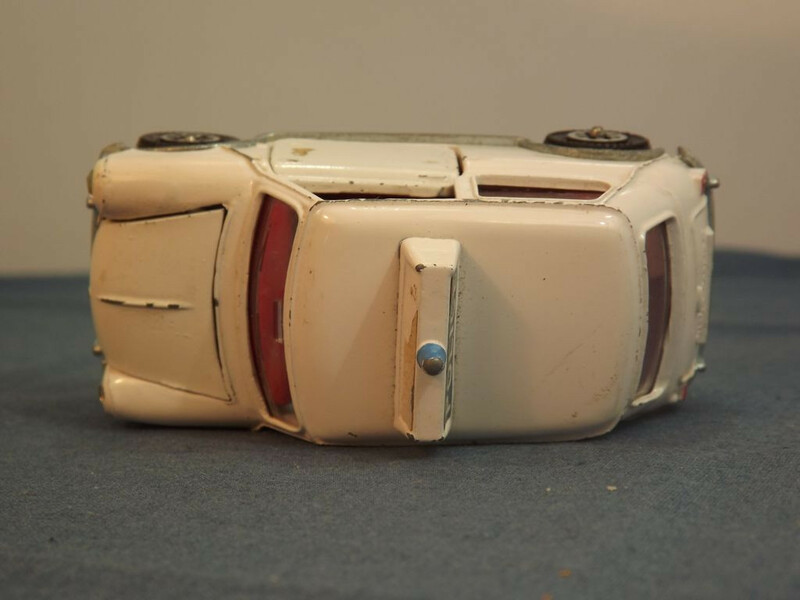 The two front doors and bonnet all open on this model. All other detail is cast into the body casting. At the front the vehicle has a silver grille, bumper and number plate that are actually part of the base. The number plate is black lettering on a white background [INJ 72L]. Either side of the bonnet are two yellow jewel lensed headlights. The bonnet opens to reveal a silver motor (also part of the base casting). The two opening side doors have paper labels reading "Police" in blue lettering. 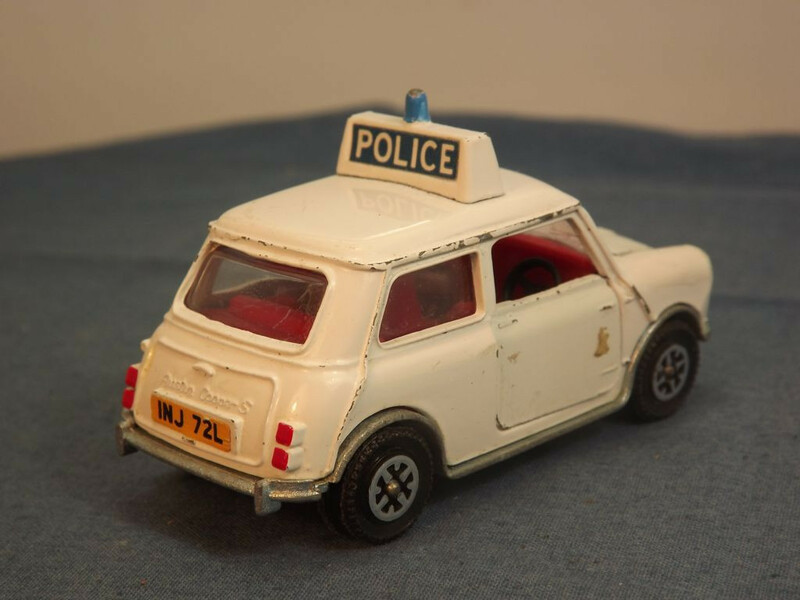 The roof is white and carries a mounted roof light domed beacon (Blue) and this sits on the roof box that should carry blue Police labels, but on this model the front label is missing. The rear boot lid and Austin Cooper S badge are cast in to the body. The red tail lights are painted raised castings, the number plate is another paper label with black lettering on a yellow background [INJ 72L], and the rear bumper is silver (and also part of the base casting). The interior is all red and there is a black steering wheel set into the "dashboard". All glazing is clear with molded windscreen wipers and interior rear view mirror. All wheels are one piece, "speed wheel" units, one piece cast plastic hub and tyre style with 8 spoke chromed centres. 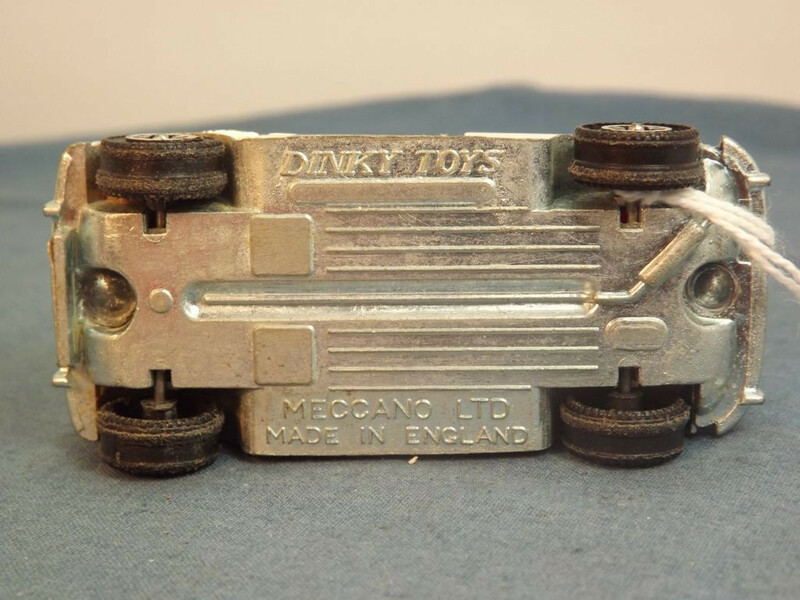 The base plate is unpainted metal that carries the legend "Dinky Toys" to the centre top, and "Meccano Ltd, Made In England" on two lines at the centre bottom. It is held in place by two machined rivets, one at the front and one to the rear. 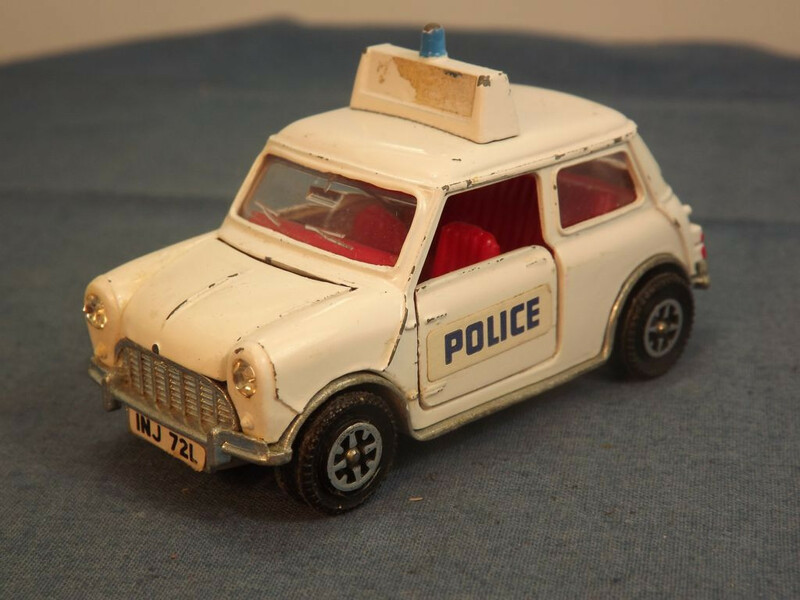 This model was issued between 1968 and 1974.